From the day we opened the doors at Grassroots IT over 10 years ago we have had a passionate focus on our clients, and how we can best help “keep the light green” for them, so they can focus on growing their business and not be held back by technology problems. We obviously need certain technical skills to help deliver on this, but just as importantly we need to effectively engage with the people involved. Thus our tagline – “IT Help for Humans”. It’s been shown time and again that we can offer the best technical solution to a problem, but if we fail on the personal engagement piece we will likely end up with a complaining client, or worse yet an unhappy client that we don’t even know about. We track various hard metrics within our service delivery teams, such as average time to resolution, and open tickets, but ultimately all of these metrics are about achieving one thing – client satisfaction. We could have the best time to resolution in the world, but in the end if the client isn’t satisfied, then it’s all for nothing. So how do we track and measure client satisfaction? We’ve tried various approaches over the years, some of which have worked well, others less so. One on one meetings with our clients have and will always play an important role in what we do. In person is ideal, however video or phone call can also be effective, as long as all parties are comfortable and able to communicate well via the chosen medium. Nothing can beat the in person meeting though, as it lets all parties properly engage and respond to each other on all levels including spoken word, body language, and micro-expressions. Ultimately people do business with people, so engaging in person will always be best. There are however some shortcomings with only relying on one on one meetings. The most significant being that these meetings are almost always attended only by senior executives and management. Engaging at this level is of course an extremely good thing, however the challenge here is that the services Grassroots IT delivers touch all levels of an organisation, not just the executive suite. By only engaging and receiving feedback from the executive team we may only be getting one part of the picture, while missing out on vital information that others may offer. It’s also worth noting that often meetings of this type tend to focus on problems, without acknowledging and learning from the wins. Dealing with problems is important, but again this can lead to a very one-sided discussion. With online services such as SurveyMonkey.com and Promotor.io, surveying your client base is easier and cheaper than it’s ever been. We have tried a range of methods including long-form surveys, short multi-choice questions, and Net Promotor Score (NPS) surveys. We have also tried various frequencies for these surveys including Annual, Quarterly, Monthly and on-demand. Surveys can provide some excellent insight into your client base if you ask the right questions, however in my experience they don’t offer a very useful method of assessing client satisfaction. As surprising as this may sound, I’ve got one main reason for this. Getting the frequency of surveys right is tough. Too often and your clients will become jaded and not bother responding. Too infrequent and the feedback will be an isolated moment in time, and likely not accurately portray longer term sentiment. For example, imagine a perfectly happy client who has an unfortunately negative experience with your services, then gets surveyed that afternoon. Chances are they will respond to this survey negatively, despite that fact that this is not indicative of their feelings for the other 364 days of the year. What surveys are really good at is getting a better understanding of what your clients are thinking, and what’s important to them. For example, you could ask them to select their top priorities for their IT budget this year, so that you can better understand how you can help them achieve this. This is an interesting one that we’ve only recently implemented, so the verdict is still out on the value of personal follow up phone calls. The way that we have implemented this little experiment is to have a member of staff select a handful of closed tickets from the previous week, and make a personal phone call to each client to elicit feedback on their experience, and offer to follow up on any outstanding items. Clients are selected with a view to providing a representative cross-section of feedback across different clients, technicians, and problem types. Feedback so far on this technique has been mixed. Because we are talking with the actual person involved in the issue (and not simply their senior management) we often get valuable, constructive feedback from the people directly impacted by our services. We do however also get some people who are simply baffled, and can’t understand why we’re calling. Our immediate intention is to continue with this experiment, while refining our methods. As we learn more and decide whether to continue or cease this I’ll report back in a future blog post. Not long ago per-issue feedback was, for me, a wasted effort, despite the value it promised. The reason was simple – poor response rates. 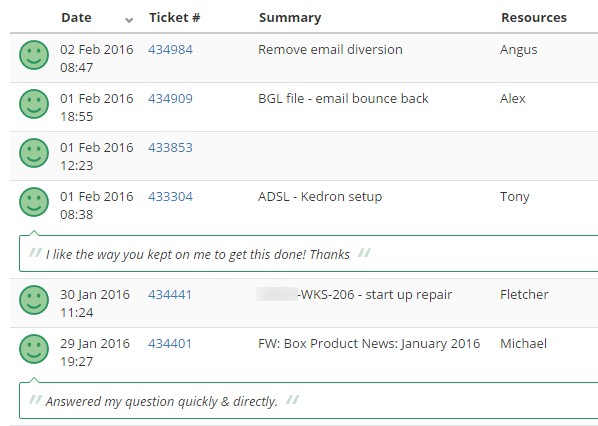 When we close a ticket in our system, the client receives a confirmation email confirming that the issue has been resolved, and providing some details. We have always included in this email some words and a link requesting feedback on how we did with this particular matter. 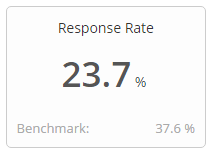 Despite what we tried response rates were so low as to be pointless. This all changed a few months ago when we implemented a new system to help capture these per-issue responses. Now with the click of a button each client can rate their satisfaction as either Positive, Neutral or Negative, with the option of leaving a short comment. 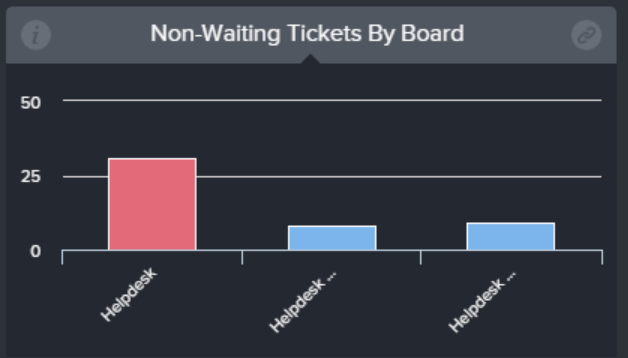 Not only have response rates gone through the roof, but we are now able to report on those responses against a range of other data such as which technician worked on the ticket, and the nature of the issue.